If you’re looking for a solid, low priced option for shared web hosting, iPage Web Hosting might just be what you need. When visiting iPage right away you get a feel that they are a solid company with a commitment to customer service. Offering a ton of features at a price point that establishes itself firmly near the top of the cheapest hosting providers, iPage is a great option for individuals and small businesses. Even if your business is on a small budget, iPage offers rates that even the most meager of budgets can easily afford. If you need cheap hosting that provides a ton of features, check out iPage. With a price point of $3.50 on 2 year hosting plans, iPage ends up being one of the cheapest options in our index. At $3.50 per month, you can purchase 2 years worth of hosting for just $78.00. That’s what some web hosting companies charge for a single month! Regardless of your budget, iPage hosting plans keep your pricing low while still providing most of the features you need. iPage is very competitive in terms of performance (whether or not your site will stay up) due to a comprehensive 24/7 monitoring policy for their servers. iPage also offers 99.9% uptime and a wide range of support options for anyone running into hosting problems. From the support side, iPage offers web chat, toll free telephone, support tickets, emails, and an extensive knowledge base all available 24/7. 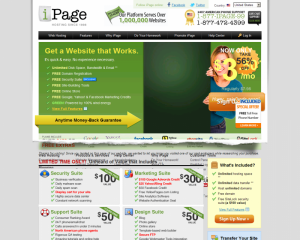 iPage also provides an ANYTIME money back guarantee. iPage is one of the easiest to switch to web hosting providers. Not only do they provide many 1-click install scripts and use the industry standard cPanel administration interface, but they also offer a FREE site transfer service which can let you move your site completely hands free, without digging into the dirty details. Overall, iPage is an extremely affordable and powerful web hosting option. For a low monthly price, you get all the features you’ll probably need plus a solid support and performance history that will help you ensure your site will always stay running. Whether you’re looking for individual web hosting or small business hosting, iPage can help you out without breaking the bank.